A Bioluminescent Paintball 10 includes a shell 12 defining an interior cavity 14 , a liquefied substance 16 disposed within the interior cavity 14 , a phosphorescent material 18 disbursed throughout the shell 12 for providing a visible "tracing" effect when the bioluminescent paintball 10 is ejected from a paintball discharge device, a neutralizing agent 20 disbursed throughout the liquefied substance 16 for neutralizing calcium disbursed throughout the liquefied substance 16 thereby preventing light emission before the paintball 10 impacts a target, and a photoprotein 22 disbursed throughout the liquefied substance 16 for reacting with calcium disposed upon a target after the bioluminescent paintball 10 impacts the target, thereby rupturing the shell 12 and allowing the liquefied substance 16 to engage the calcium to produce visible light. A paintball 100 includes a shell 102 defining an interior cavity 104 , an insoluble coating 106 disposed upon an inner surface 108 of the shell 102 , and an aqueous material 110 disposed within the cavity 104 such that the aqueous material 110 engages the insoluble coating 106 , thereby preventing the aqueous material 110 from dissolving the shell 102 , and promoting the marking of a target via the aqueous material 110 when the paintball 100 forcibly engages the target and ruptures the shell 102. The technology is for paintballs made from plant-derived shell materials and water-based fills. All current paintballs are made with gelatin (animal derived) shells and fills composed of polyethylene glycol (petroleum derived) or oils. 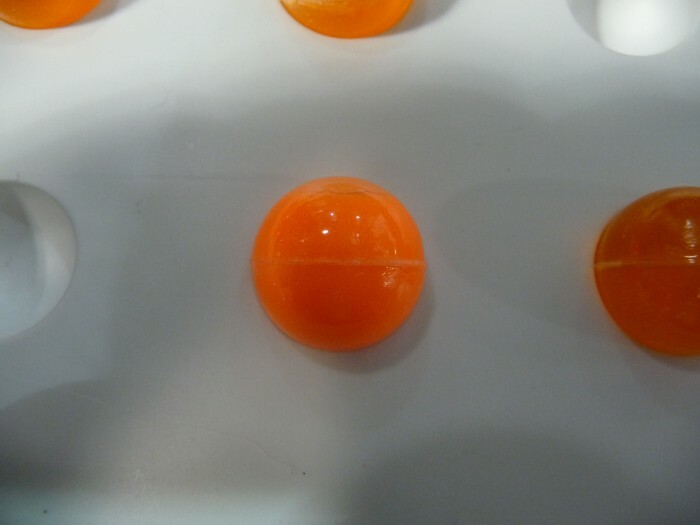 Gelatin paintballs have disadvantages of higher costs of manufacture, humidity instability, paintball field clean up issues, temperature instability, and the gelatin left in fields has an unpleasant odor. Current paintballs are made using softgel manufacturing technology, the same as vitamin capsules, and is limited to using only gelatin. Our technology uses modern plastic processing methods to manufacture paintballs using an environmentally friendly, plant-derived, polymer shell and water-based fills. The products are much cheaper to manufacture, have more consistent quality, are more temperature stable, more humidity stable, easier to clean up in fields, and do not produce any unpleasant odors in the fields. 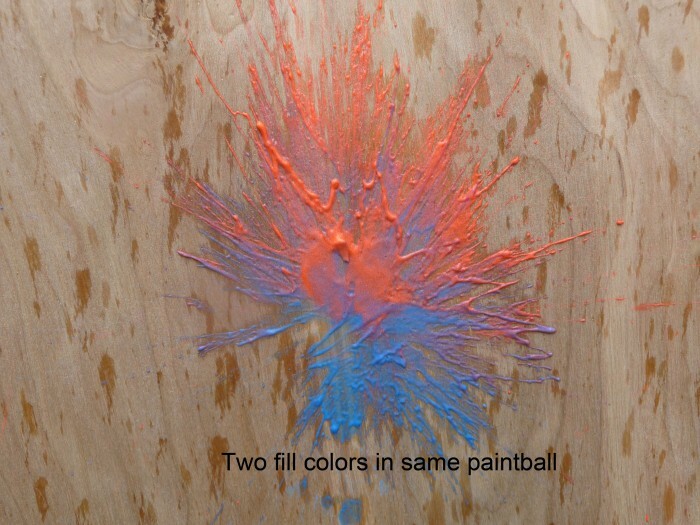 We are able to make 4-color paintballs with 2-color shells and 2-color fills. The existing paintball market is about $100 Million annually from 2-3 major manufacturers. Our next generation paintball could be expected to capture $40 million in annual sales within three years. The technology has been developed through proof-of-concept, materials and process selection, and small scale manufacturing. The technology is ready for scale-up. There are two US Patents, multiple foreign patents, and patent applications. 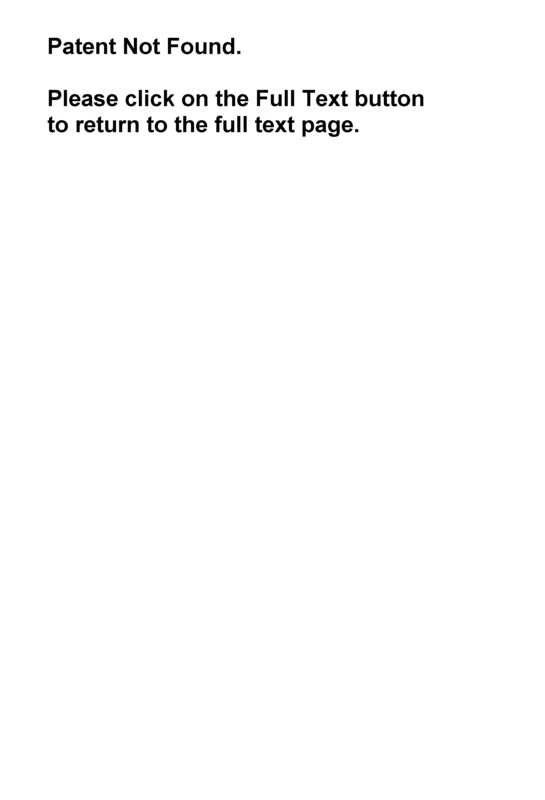 We will consider sale of all patents or a licensing agreement. Technical assistance is available from the inventor to make the business successful. 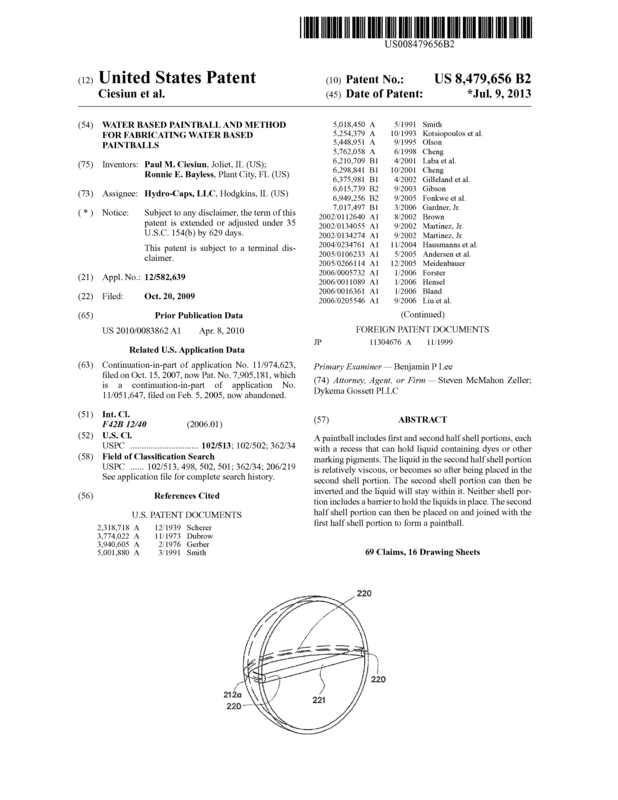 Page created at 2019-04-21 18:37:12, Patent Auction Time.